Gorgeous card, I like the colours Thanks for joining in with us at Hooked on Craft this month, Good Luck. 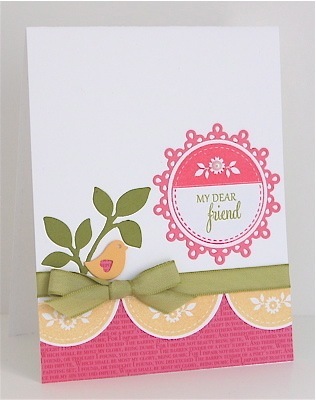 I'm with you in the frizzy department....gorgeous card, love the pretty spring colours. Maureen - this a so very lovely, and sure to brighten anyone's day! I love everything about it! Love and hugs to you!!! Have I told you lately that I miss you? Well, I DO!!! What a super yummy card, Maureen! The colors and layering are FABULOUS!! So glad that you join the fun with us at CAS-ual Fridays! LOVE these sweet spring colors! The die cuts are simply darling, and I especially like the way you used the tag image to make the large scallops. Thanks for joining us this week at CAS-ual Fridays! Darling design and I love the colors! Thanks for playing along at CAS-ual Fridays! Stunning clean and simple card! Love the colors too. Sure glad I saw it over at MIM. What a beautiful, refreshing card Maureen. The design is wonderful and I love the diecut for the sentiment. Truly inspiring honey! Really love it! I'm so happy that you joined us this week with your lovely creation!